Bill Judge and Walter at Annapolis Boat Sales finished up work by late Jan. Since then I’ve ran the boat, tested the systems and love whats been done! 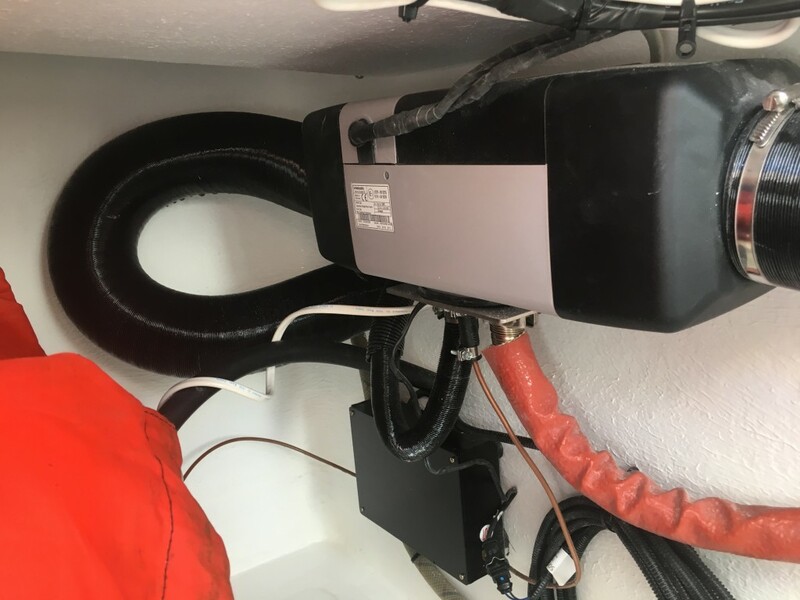 Reliable Marine joined the upgrade train by taking care of some electrical issues 7 years of corrosion can cause……. new windless and pulpit definetly improved greatly the situation I had. Good stuff! Next up front are my bow rails……had some problems with loosening of bolts. They reinforced the rails by getting up under the rails and affixed backplates and bolts…..totally fixed that problem. Next down the line I have new windows and frames installed. I had one window with a crack and others had an issue or two…..the frames were starting to show corrosion so I had those replaced also. 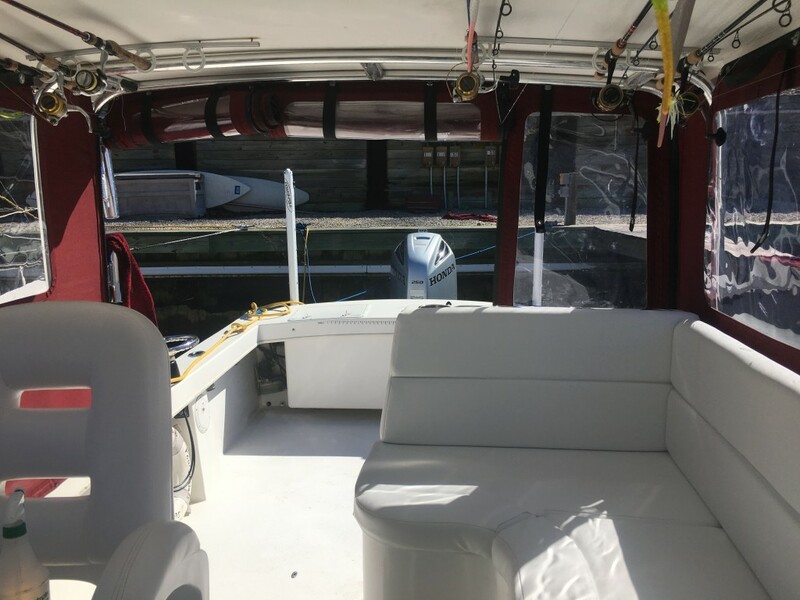 the new frames and windows are updated from when my boat was built. Everything is very sturdy and easier to operate! new floor came out great! not a good shot of the floor but you get the idea! 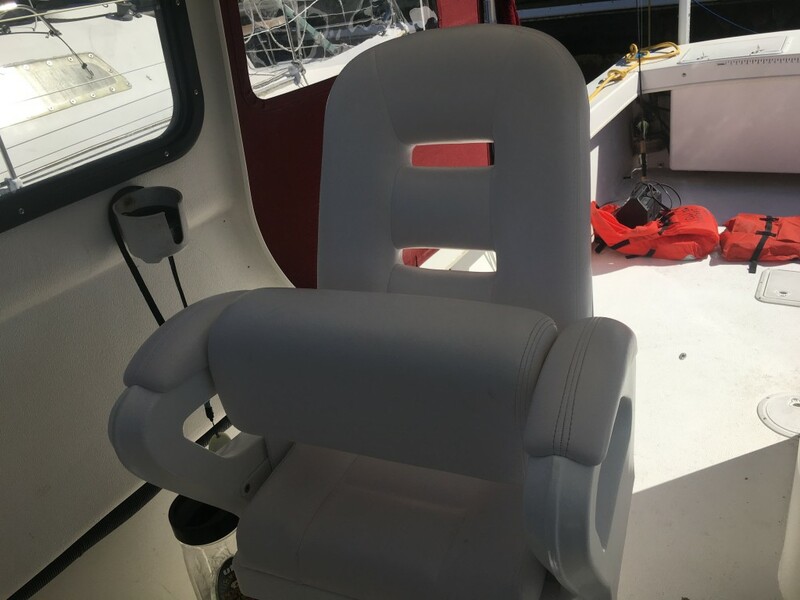 Love my new Captains Chair………it has a leaning post along with the chair. So far I love it! 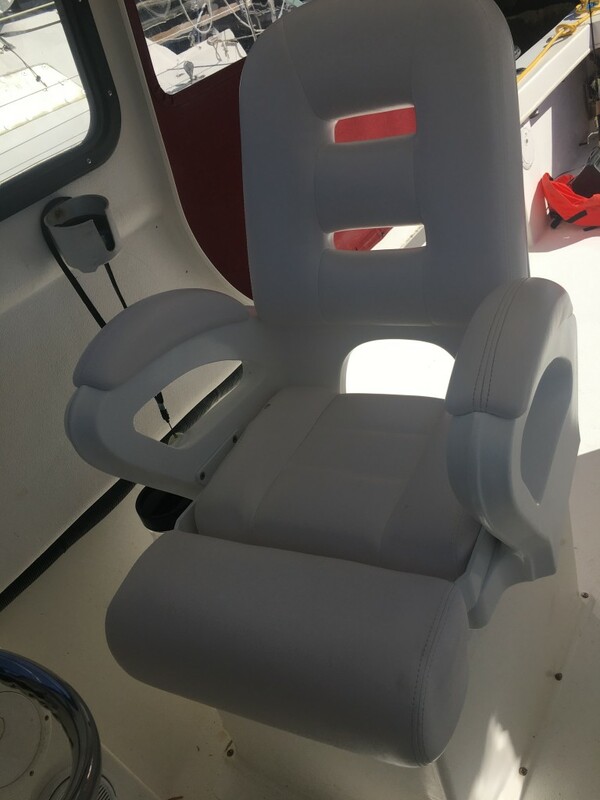 Very comfy……..expecting to be on the boat a record amount this year…..I need a good chair! I’m not getting any younger……. Next in line is the L-Bench seating. Now that i’ve done some trips and received feedback from folks on the boat I’m VERY happy! 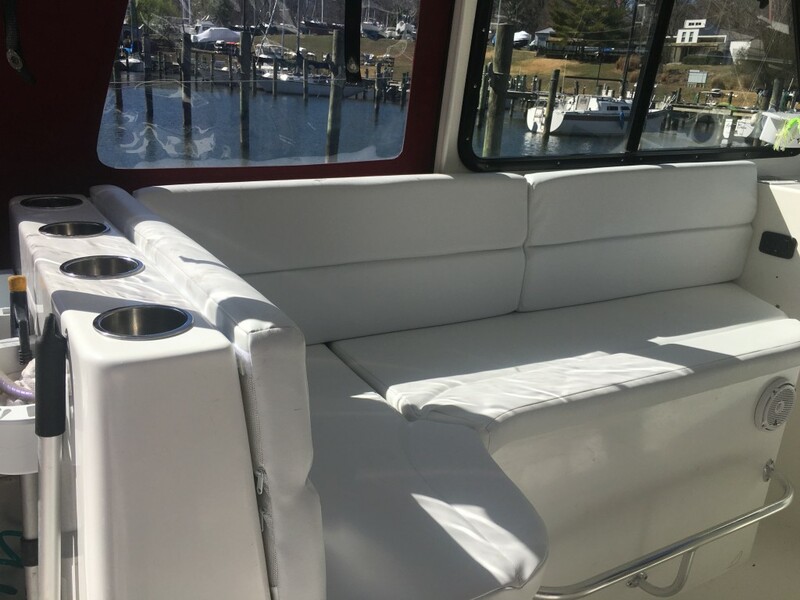 plenty of room for 4 to sit……5 if you are good friends! 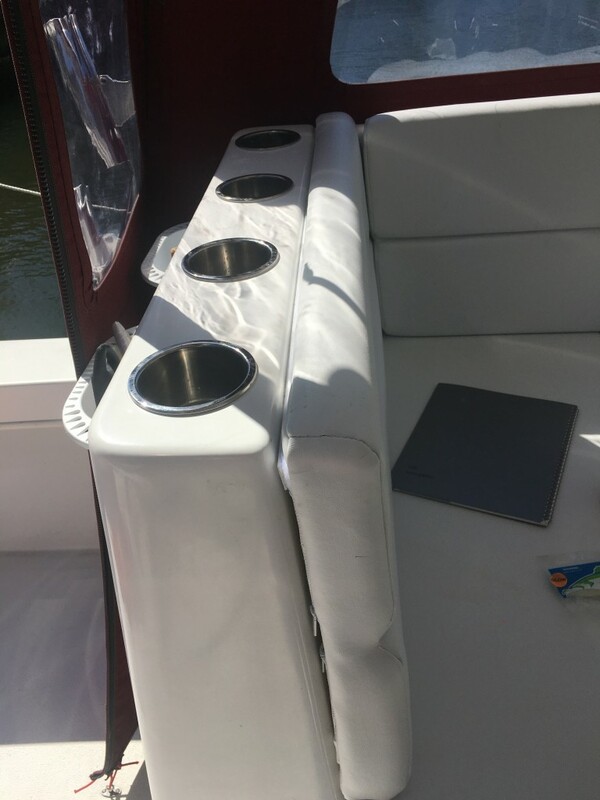 built in cup holders! I needed those! Under the seat is also lots of room for stuff! Very happy with the seating and storage! Cushions make it comfy to boot! The thing I like the best is the new heater! 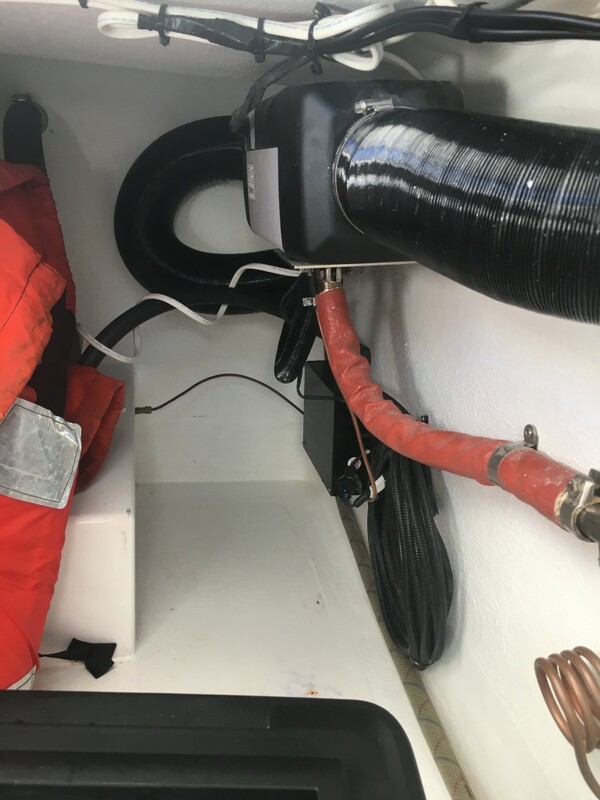 It’s a Webasto 3900 marine heater. The Judge boys had to custom install this thing and I know it wasn’t easy! The end result however is spectacular! I’ve ran it about 100 hours so far and it is flawless to this point. I”ll add it’s not a cheap gadget by any means. 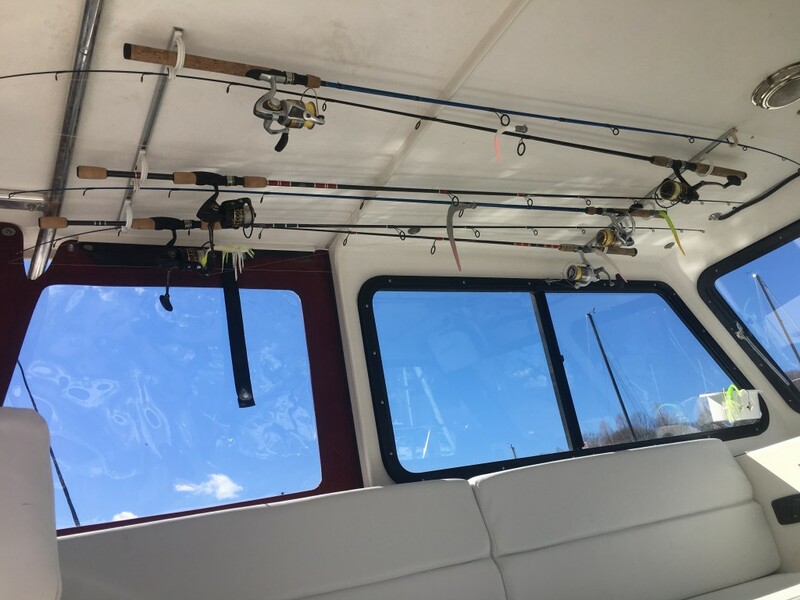 I love heat…..hate trying to think while freezing and it’s awesome for folks fishing on my boat in the cold. Wether it’s a chilly October/November morning or a freezing cold day in the winter this thing is a HUGE asset! It puts out a max. of 13400 BTU’s and burns 1 gallon of deisel fuel per 20 hours of operation set at medium. Medium setting warms my cabin nice even on 22 degree mornings with the back curtains down. Here are some shots of the install and unit. Unit is mounted up under the L-Bench along the side, up off the floor. Heater is the size of a loaf of bread……Judge did a great job with placing duct work, exhaust etc…….freak’in great! 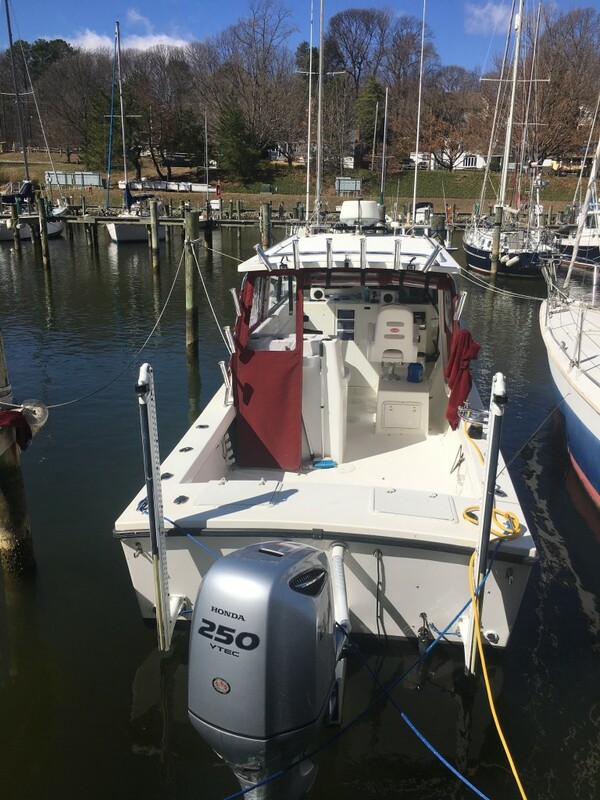 Walter George from Annapolis Boat Sales had a great idea for my boat and man was he right! He installed an incredible light bar called Fathom lighting www.fathomlighting.com. This thing lights up the world up front. The first night I tried it was reality…….won’t live without this type of light on a boat ever again! I also had Walter install new flood lights for the back deck and blue lights under the gunnel. You can find Walters great stuff at www.marylandboatgear.com. Thanks Walter! Great job by you and your crew! 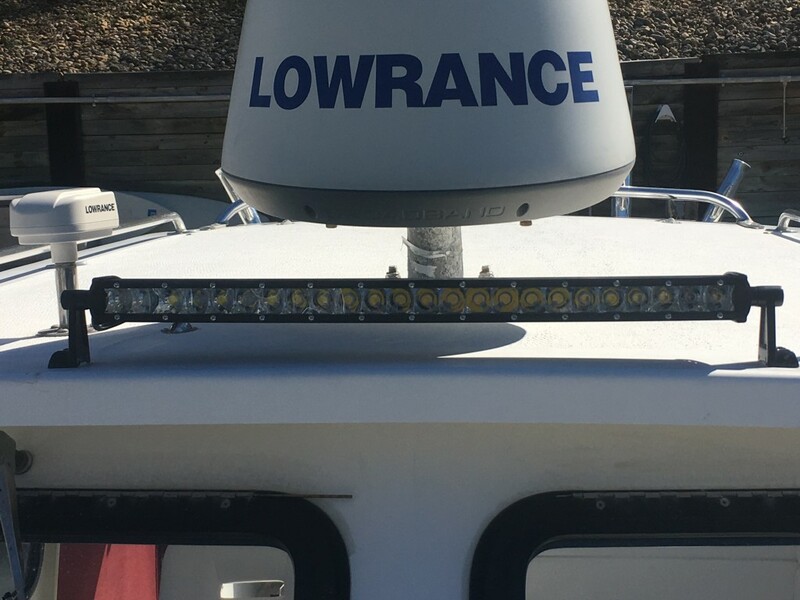 low profile spot/flood lights for the bow…..they are awesome! 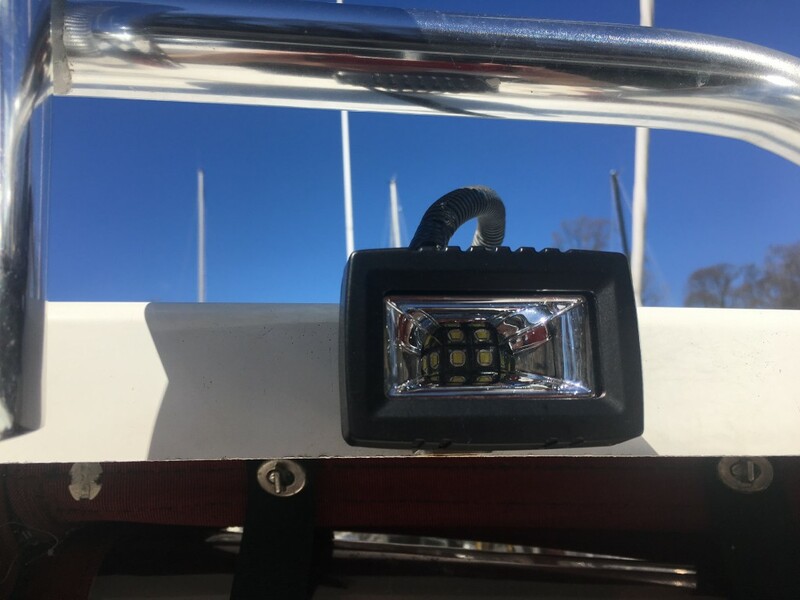 Two of these light the back of my boat UP! Little LED’s use little juice to do it! My Shop! Love these guys! 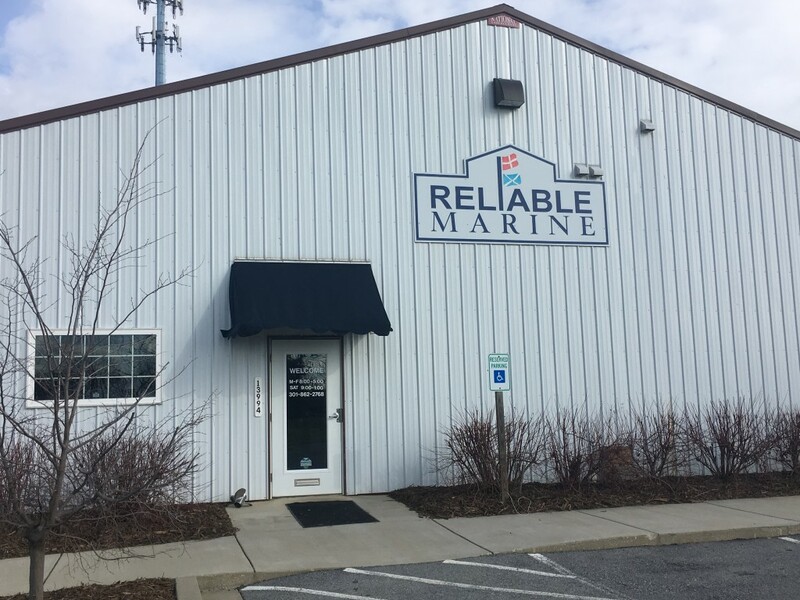 Next on the list is some stuff recently done by Reliable Marine in Solomons, MD, www.reliablemarineonline.com Now that I have more room to install stuff I had Dave at Reliable Marine install an onboard battery charger which he tied into my shore power hook-up. 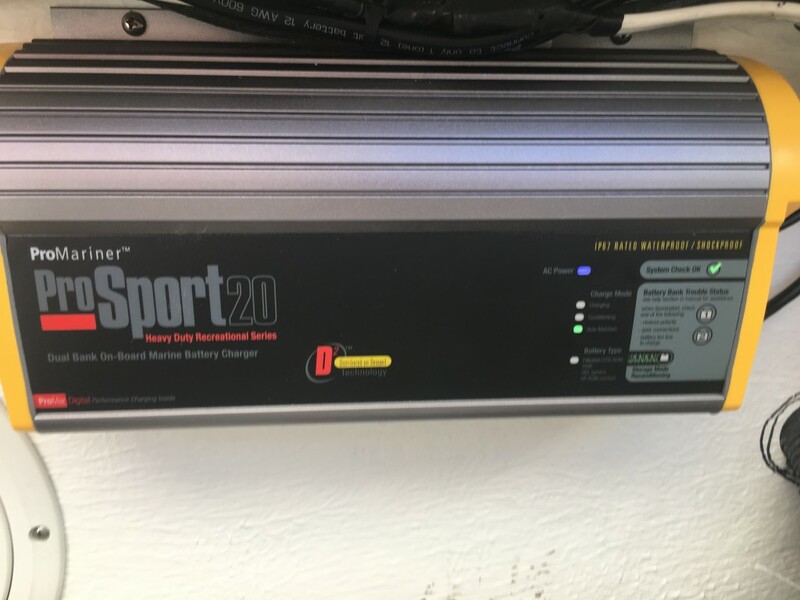 No more problems with a dead battery because of something left on or other battery issue. This thing manages the batteries and lets you know of any problems before you break down! This gadget is installed under my L-Bench…..it’s up and out of the way and easy to see. 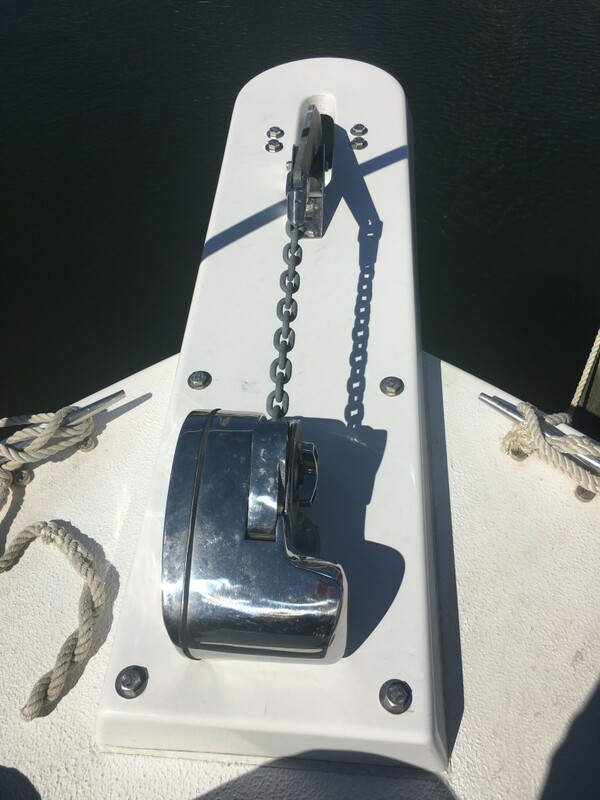 Dave at Reliable tied it into my shore power making it real easy to use! After renovations done…..lights….Heater….etc I noticed some funny electrical things going on. Main thing was upon start up of my engine my fishfinders were shutting down. Never did that before! I start and stop often so fishfinders going on and off is a NO GO! Dave at Reliable told me what he thought, I listened. Pulled the boat and ran it over to him. He thought a battery isolater would benefit me and he also found plenty of issues in my battery compartment caused by 7 years of corrosion! He knocked that issue “out of the ballpark”! Did alot of rewiring in the battery box etc…….cleaned it all up well and installed the battery isolater……electrical issues GONE! I hate trying to figure this stuff out! Thanks DAVE! wires re-done…..cleaned up and labled……gives me piece of mind! 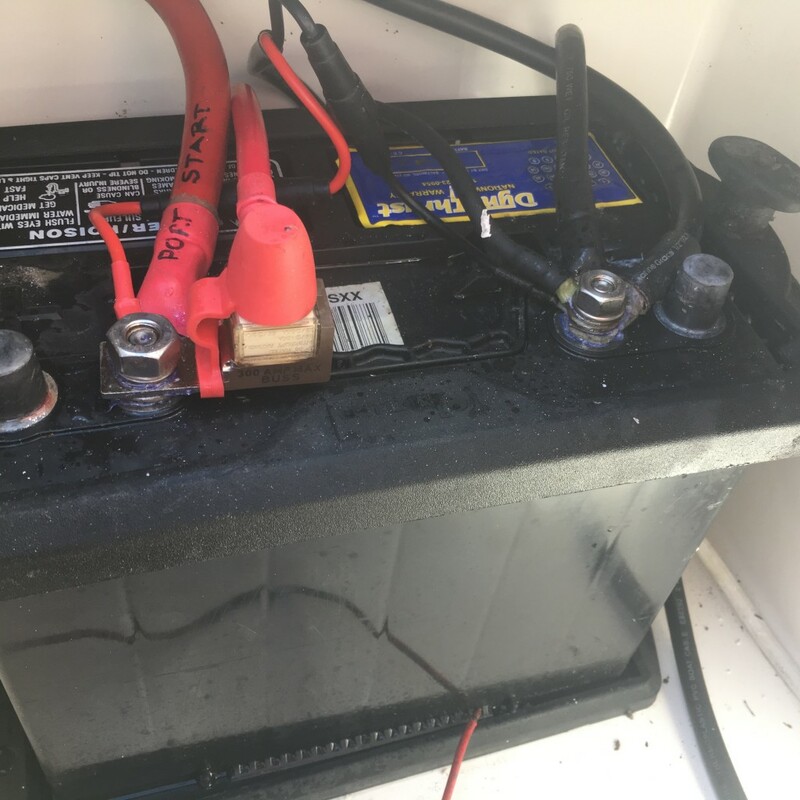 new battery isolater won’t let my fishfinders shut down ever again while turning on and off the engine! I like that! Had lot’s of stuff done! I’m very happy and feel like I’ve got a new boat! Based on last year and what trips I’ve got booked already it looks like this is going to be a great year! Can’t wait to get lot’s of sticks bent this year! Thanks to all who fish with me and hopeful future folks who will be on my boat! Let’s go fish’in!!!!! !